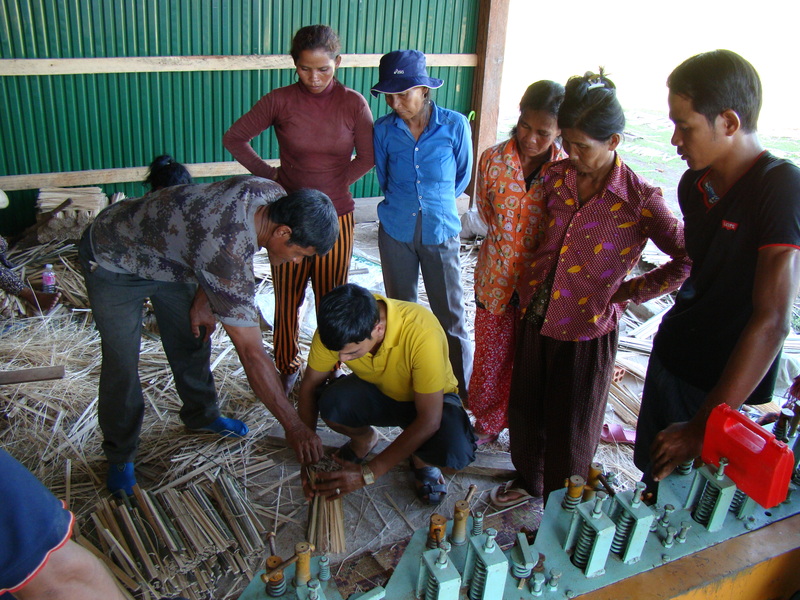 The Bamboo Incense stick hadicraft group has been established for nearly one year with support from the Commune Forestry Administration and Rattan and Bamboo project in collaboration with WWF-Cambodia. Since its establishment the community members have stopped migrating outside in search for a livelihood away from their famílies. The bamboo community is located in Dorng Peng commune, Sre Ombel distrtict, and Koh Kong province. The bamboo incense stick is actively produced during the dry season, it isn’t an easy task to harvest bamboo from the community forest. It’s even harder during the rainy season, as one has to dry the bamboo before chopping into smaller sticks. The entire community works in the rice fields during the monsoon as it is their primary source of income. However, most of them don’t have much to do in the other seasons, the families that work with the production of bamboo are able to increase their overall income. The production team consists of 20 families. So far, in one year, they have produced 2 tonnes of bamboo incense sticks and 5 tonnes of bamboo strips which is equal to 1,400 USD to Bopha Angkor craft in Tboung Khmum province. Production of bamboo incense stick is the secondary source of income for the community and it helps improve their living conditions as their primary source (Paddy rice) often doesn’t provide enough income. This job provides them with work all-year-round. It has also caused a drop in migration — where farmers leave their community behind in search of work at other provinces. There is high market demand for bamboo incense sticks and bamboo strips from craft partners so the community can countinously produce as required. Cheng Oun, a member of the bamboo incense stick community, says she often goes to collect bamboo by chopping and chunking it from the community forest and brings it home. The selling price per kilogram of bamboo strip is less than that of bamboo incentive stick due to the easier nature of its producion. Cheng Oun added that some families the husbands collect all the bamboo from the forest and their wives are at home to help cut the bamboo into pieces so that they can accelerate the production line to supply the dealers’ demand on time. The bamboo community regularly conducts monthly meetings involving officials from the commune forestry administration to collect the reports and set up workplan. This promotes sustainable management and use of bamboo resources, so that the entire forest ecosystem where bamboo grows is conserved. Production of bamboo incense stick is the secondary source of income for the community. 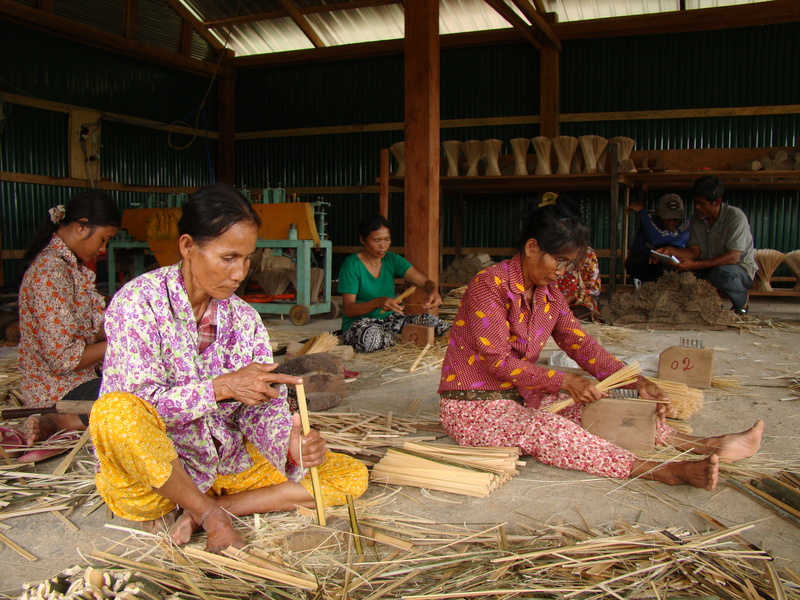 The bamboo community is located in Dorng Peng commune, Sre Ombel distrtict, and Koh Kong province.